One of Ireland's and indeed one of Europe's oldest and finest hotels, the Shelbourne Hotel has been a focal point in Irish history and life since it opened its doors in 1824. The hotel was one of the first buildings of the period to have indoor electric lighting, and since then has consistently set the standards which other hotels have followed. Each of the Shelbourne's luxuriously equipped and exquisitely decorated en suite rooms and suites come complete with remote control satellite televisions, radios, direct dial telephones, modem points, trouser presses, and mini bars. Additionally, each of the suites has its own private sitting room. 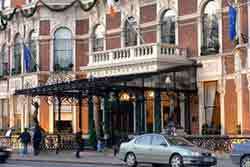 Home to two bars, two restaurants, and a magnificent tea room, the Shelbourne leaves visitors spoilt for choice. The Shelbourne Bar is a nostalgic Dublin bar. It serves an excellent pint of Guinness and is renowned for it's traditional Dubliners' bar Menu. "The Shelbourne Club" facilities include a swimming pool, sauna/steam room, jacuzzi,Gym, aerobics/strength training studios, and changing rooms. The hotel also offers a complete range of massage and reflexology programs. The hotel is located on St Stephens Green, just a two minute stroll from cosmopolitan Grafton Street with its exclusive shops, bars and clubs. Just five minutes stroll from the hotel visitors will find The National Gallery, Government Buildings and The Natural History Museum.